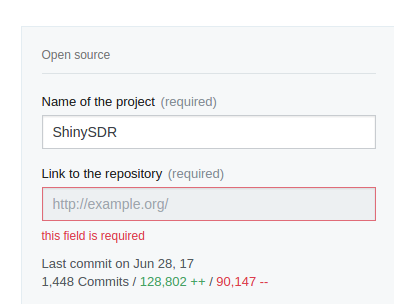 I was just updating my Developer Story (currently set private, so the link is only for the sake of SE developers) content, and I found that I could not edit one of my GitHub open source project entries (ShinySDR). Specifically, whenever I click the Save button, it clears the "Link to the repository" (which already had a good, and uneditable, value) and displays a required-field error (and is still uneditable, so I cannot save). I did not experience this error when editing other GitHub entries. It might have something to do with it having been imported from a previous iteration of Stack Overflow Careers-or-Jobs-or-whatever. I expect that I could delete and recreate the entry as a workaround. I'm leaving it be for now for the sake of reproducing the bug. We update the repository statistics (last commit date, number of total commits, additions, subtractions) if you have pushed to the repository in the last 7 days. We use GitHub's Events API and check for "PushEvent"s for repository urls that match items on your developer story. Since we use the url of the user story item to sync the repository statistics, we make the url field uneditable. However, there was a bug that was overriding the Url with null values when editing an item that has been synced with GitHub. This should now be fixed on production! Thanks very much for reporting this :).